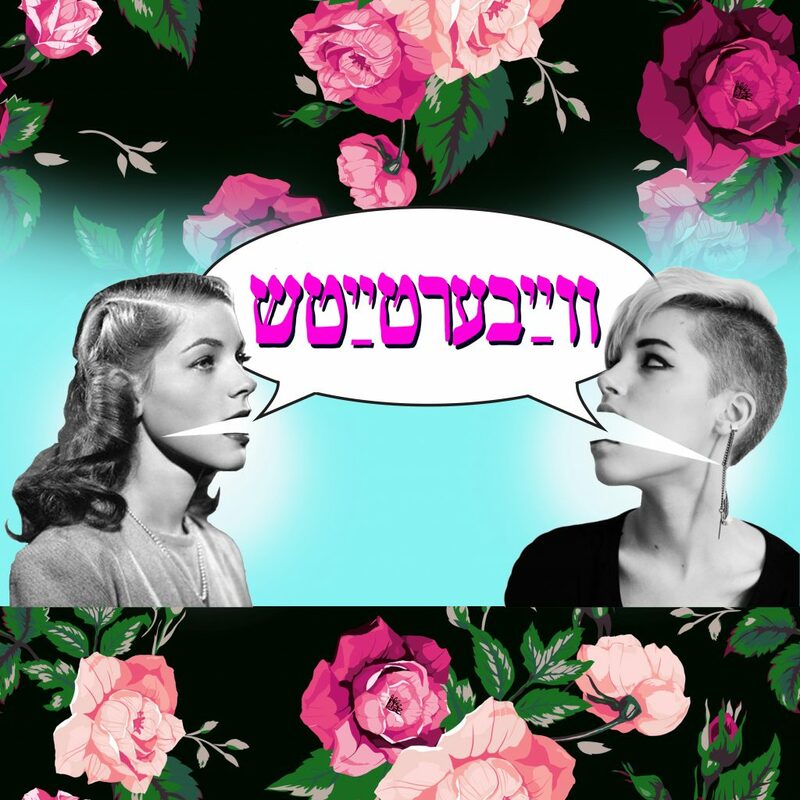 The following is an edited and condensed conversation between Sandy Fox (Sosye, in Yiddish), the creator and host of the feminist Yiddish podcast Vaybertaytsh, with one of the podcast’s listeners, Talia Martz-Oberlander. Sandy Fox: First, it’s important to say that I grew up going to a Zionist summer camp, and one of my best friends from camp grew up in a Yiddish-speaking household. So when I got involved in Yiddish more seriously there was nothing weird or unheard-of about it. I knew that there were people that were not Chassidim who spoke Yiddish with their kids. I recently finished my PhD at NYU in American Jewish history, but when I first started I was studying Israeli history and I had to learn another language beside Hebrew. At the time, I was already kind of moving away from the topic of Israeli studies, and then eventually realizing I didn’t want to study Israel in any sort of primary way. I was also becoming friends with Naftali Edelman, one of the founders of Yiddish Farm, so I was hanging out with these Yiddishists in New York. The term Yiddishists today generally refers to enthusiastic Yiddish speakers who either came to learn the language later in life or who grew up speaking it. We often speak Yiddish with friends with whom we could clearly speak English (or a different common language). It is an ideological choice, really, to speak Yiddish and keep Yiddish contemporary, strong, and part of our everyday lives. Naftali turned to me one day and said, “You should come to the farm. I know you have to take another exam. I promise you in two weeks you’ll be able to speak enough Yiddish to pass your department’s exam.” So I said, “Okay, why not.” And that’s exactly what happened. I learned a tremendous amount in two weeks. Enough to be involved in conversation and respond in certain basic ways. From there I didn’t expect to fall in love with the language. I really expected to do enough to learn for the exam, but it turned out that I really loved it. It felt increasingly natural coming out of my mouth in a way that it never really felt Hebrew did. And the Yiddish world really became a community for me. Talia Martz-Oberlander: The Yiddish Farm is a big center to the Yiddishist community. It definitely has, or has had, a big cult following in the Yiddishist world in North America and also Europe. I assume that you’ve had listeners from other continents, right? Fox: Absolutely, 20 different countries. Martz-Oberlander: Oh my gosh, that’s so cool. Whereas a lot of North American Yiddish circles have a very secular flavor, the Yiddish farm is specifically like, “No, we’re orthodox, and this is a big part of us.” I come from an egalitarian background and am flirting with orthodoxy in my husband-to-be’s community, which is very traditional-orthodox.I’ve been dancing between the two. But being at the farm was really cool because I was kind of tired of the very secular YIVO thing. I’ve always been religious in some way. Fox: I think you’re onto something. It’s really interesting because a lot of people who don’t speak Yiddish, but admire Yiddish, are these sort of secular, socialist, radical Jews, many of whom are my friends, and I identify with aspects of their ideology. But the people who speak Yiddish in reality are a completely diverse sort. They’re not just secular or Chassidic. They’re not just Zionist or anti-Zionist. There are a lot of different types of people. I was actually listening to the editor of Protocols as well as the new editor of Jewish Currents on the podcast Treyf yesterday and they were both answering questions about Jewish identity. I don’t really think about that at all because coming from the Yiddishist community, if you are a weirdo enough to want to learn a language that has very little in terms of a contemporary cultural output—not to say that there’s nothing, but in comparison to learning French and being able to go to France and be immersed in French culture, there’s obviously no parallel to that in Yiddish—if you’re odd enough to have the love of this language that leads you to actually learn the language fluently and maybe raise your children in it, then your political and religious affiliation is the least of my concerns. In a lot of ways I feel that the Yiddishist world, and maybe I’m idealizing it, but I do feel like it’s at times this unique bubble in which as long as you have this core thing in common you see people from different religious and political backgrounds relating to each other a lot more than they do in other Jewish institutions. I love that I have listeners who are completely secular and Yiddish is the way that they engage with their Jewishness; and I also love that I have religious listeners and Chassidic listeners who listen secretly, perhaps, or anonymously. In a lot of ways, I think the Yiddishist community is unique in its ability to bridge a bunch of gaps that otherwise exist. I was listening to that podcast and I was just like, I don’t know, people still care about this secular-religious divide thing? Yes of course they do. It’s just in the Yiddish world, with the exception of the farm because it’s a place you live and you want the place you live to reflect your values, but since Yiddishland is not a place we all live in all the time, halivei, if only, there’s not a lot of space to fight over that. There is more just mutual respect for people willing to take that step to learn a language well enough to live their life partly in that language. Fox: Do you notice this? Fox: Yeah, it’s important to say that there are a lot of different Yiddish circles within this relatively small community. Like any community there are definitely insider-outsider things and I think you’re right about the exclusivity factor. I find that people have to really prove themselves as super interested in Yiddish in order to gain that access. You have to show a commitment level that’s extremely high before people are more welcoming. And that’s probably something we should fix. At the same time, I was at a cafe yesterday in Tel Aviv and I struck up a conversation with the guy I was sharing a table with. We were talking about the podcast and he asked are you going to translate episodes? And I’m like, “No, I’m not really interested in that.” He couldn’t fathom it. I said, “It’s really for people who speak Yiddish. I’m not concerned with people who don’t, yet. I’ll be concerned with them when they’re learning, and I’ll make the podcast friendly for people who are learning, but I don’t make it friendly for people who don’t know it at all.” So, I guess I’m also making it a high bar for entry, but I feel like that’s what the form calls for. Fox: That’s something that people can get very uncomfortable with. When there’s not access. People who speak English are not used to not having access. Martz-Oberlander: What [other] kinds of responses do you get when you say you host a podcast in Yiddish? Fox: Mostly people are really cool about it and have a lot of nice questions. People are surprised by how many people listen to it, which is in the 6,000 range per year. But I find that usually most people are aware that there’s a “Yiddish-revival.” And I put it in quotes because it’s been going on non-stop since the late-1960s. People have been using that terminology at the very least. I don’t find a lot of people confining Yiddish to a dead past, but I do find a lot of people asking, “Well, why a feminist podcast?” And then I explain my whole shpiel about not wanting to be in Yiddish about Yiddish. It is true, what you were saying about the size of the community. My feminist podcast in Yiddish is listened to half by men. That’s wonderful. If there were 20 podcasts in Yiddish, I’m sure that wouldn’t be the case. So, that’s kind of an advantage to me, that people are listening to women’s stories and queer peoples’ stories in a context in which they otherwise wouldn’t. In terms of how Yiddish-speaking people respond to the podcast, people are mostly positive. I’m sure there are people who have problems with it, but I don’t get hate mail. I was very fearful in the beginning because my Yiddish wasn’t so good back then, that people would feel that I was desecrating the language. I’m sure there are people that feel that way, but I think most people think the pros of having Yiddish media outweigh the cons of some student learning a mistake from me. Martz-Oberlander: Who are you able to reach in Yiddish? I’m curious about the diversity of the podcast audience. Fox: It’s very hard to have good statistics on podcasts if you don’t want to spend tremendous money on it, but I think we have about 6,000 listeners. I said per year earlier, but it’s really per month. I know from Google analytics and a bit from SquareSpace analytics that it’s half men and half women, from over 20 countries (although primarily the United States, Israel, parts of Europe and Canada, a little bit in Australia too, Japan, and a bunch of other awesome places). And I think about 60% or 70% of the listenership is under 40. So that really blows people’s minds who think Yiddish is a language that only grandparents speak. Podcasts aren’t really accessible to most grandparents; it’s not really a grandparent form of media. I can’t reach a lot of people with Yiddish, obviously, but I’m not worried about it. It sounds so obnoxious when I say that, but I’m not worried about it because there’s so much good feminist media out there and even really good Jewish feminist media, so I feel like everyone who doesn’t speak Yiddish is covered. What I’m most concerned about is who can I not reach with my level of Yiddish and how do I make my level work for people, or make it pedagogically useful. Those are the questions that concern me more. Martz-Oberlander: In what way? Can you elaborate on that? Fox: I try not to worry too much about the speed in which we talk on the podcast because people can actually slow down podcasts. And I have a whole episode in the earliest season on how to listen to Vaybertaysh if you’re a beginner. Other things I try to do to make it accessible and pedagogical is if I use a word that’s not an everyday word, I usually say it in English afterwards. Those are the questions I’m thinking about. How can I reach those people? How can I help them? How can I make the podcast entertaining and interesting and thought-provoking and also at as high a quality of Yiddish as possible? Martz-Oberlander: As a listener that that’s one of my favorite aspects of your podcast. On each episode you may be speaking with a Yiddish speaker from birth, or a student, and you can hear that they are at the start, finding their Yiddish voice. How does Yiddish sound coming out of their mouth? It’s really beautiful and also inspiring. And the grammatically idiomatic speakers are good for learning, but then hearing your peers and their process learning the language is really special. It’s really rare in Yiddish, because a lot of what’s put out is put out by educators. And they want to make sure it is 100 percent correct. Fox: Totally. And also speaking different dialects and from all different backgrounds; Yiddish is not one thing. My goal was to have a platform for women and queer people’s voices in Yiddish because I really noticed that a lot of the content out there was made by men. Especially in history. My first episode is introduced with a clip from Dzigan & Shumacher’s comedy. They were these very funny, but also pretty sexist, post-war comedians who lived in Israel and performed in Yiddish. When I was at the farm, there was this summer where we used Schumacher to learn how to speak Yiddish more authentically. But it didn’t work for me because they speak in a way that felt completely outdated. And there was no female representation that I would have wanted to base my Yiddish voice upon. It was all pretty sexist, whatever there was. Stereotypical, nagging Jewish women. So, my goal was never just to provide my own voice as an example of how women speak Yiddish but rather to get all sorts of women, and not just women but also men and queer people and trans people speaking about women’s issues or something related to it in Yiddish. What comes out of that is you really get also sorts of dialects, all sorts of voices from the podcast. Martz-Oberlander: What have been some of your favorite episodes to record or favorite people to engage with on the podcast? Fox: I love the episode with my friend, Tsipe Angelson, who is a midwife in Brooklyn. We talked about her path towards midwifery and she answered questions from listeners about sexual health and fertility. And even as a Yiddishist who does talk about all sorts of things in Yiddish—and I even had a romantic relationship that probably occurred 50 percent in Yiddish—I still love listening back to that one and just hearing us talk about normal women’s health issues and her path in Yiddish in relation to women’s health and sexual health. That was really awesome. And my conversation with Yudis Waletzky. She works for Estée Lauder. We talked about sexism in the industry and contradictions in the makeup industry and design, and that was just another one where it really had nothing to do with Yiddish. I loved talking about self-care, and what self-care means for feminism. Is it really feminist or another way of putting pressure on women to look a certain way and look effortless at the same time? And also episode 27, which was called “Talking to the Dead.” I “interviewed” this woman, Ruth Rubin—an amazing folk singer and Yiddishist who went around saving songs after the war by interviewing people with a recorder around the United States and Canada. I cut audio of her and a friend also sang one of the songs that Ruth salvaged. I absolutely love that one, but I’m sure it’s one of the least popular because I talk to someone who is dead. So, it’s very funny. Are there conversations you feel like you can have in Yiddish but not in other languages? Martz-Oberlander: I think that speaking in Yiddish might facilitate me to engage with certain people at certain times in a way that I wouldn’t otherwise. For example, if I’m in Boro Park or Williamsburg and I go into a store. I’m not Chassidish and no one is expecting me to speak Yiddish. Then I speak Yiddish. That’s a way of conversing and connecting with someone that I wouldn’t get outside of Yiddish. Fox: That’s a huge one. Having access to the Chassidic world. When I talk to people they usually don’t look at me that weirdly. People usually take it in stride when a person who doesn’t look Chassidic speaks Yiddish with them. So obviously that allows for conversation that most of the American Jewish world isn’t having. For me, with the podcast, Yiddish is a little like a mask. There are things that I would never talk about in English that I do in Yiddish because I feel this sense of anonymity, even though it’s absolutely not anonymous and the numbers are scary to me in a lot of ways. Like in the episode with my friend the midwife, I definitely talked about what kind of birth control I used. Now, I’m not embarrassed about it at all, but at the time I would never say this on a public platform in English. It allows me to feel this intimacy with my listenership. Sandy (Sosye) Fox is an American Jewish historian and the founder and producer of Vaybertaytsh. Talia Martz-Oberlander studies experimental condensed matter physics in Montreal, Canada on Haudenosaunee and Anishinabeg lands.